Man, I could go pretty far afield with this one. Maybe ruminate on Eliot, Frost, Merrill, Whitman (again!) and some of the Latin poets—from Neruda to Cuba’s Carpentier and Guillen. Could name some of my favorite living American poets, including Stephen Dunn, Alison Hawthorne Deming, Lola Haskins, and Ann Fisher-Wirth. Fortunately, I’ve known some very good poets in my time —including the three American women, who are all great sports—and have staked more of my heart inside the comfort of a lyric than most guys would care to admit. 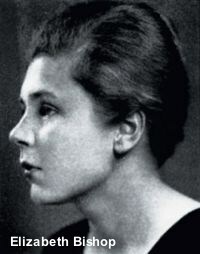 But when it comes to figuring out the shadows that dance about behind the silhouette of myth, I repeatedly turn back to Elizabeth Bishop, an excellent poet who is just now beginning to earn the widespread praise she deserves. Bishop, who earned her undergrad degree from Vassar in 1934, was independently wealthy; as such, she was able to travel widely, living for many years in Brazil and then Key West, Florida. A few years ago, I traveled to the Peruvian Amazon, upstream of Iquitos, to write a magazine piece about the “Boto”, the Portuguese name for the freshwater river dolphin. I had first learned about the Boto when, as a younger man, I watched an episode of Jacques Cousteau’s Calypso adventures as it went in search of this rare, pink-colored mammal in South America. The Boto was compelling, to be sure, with its elongated snout, and its un-fused vertebrate—which allowed it to poke its head out of the water and turn around to look, just as humans do. Although it was a bit of a throw-back to an earlier era of time when nature and evolution experimented with its world, the dolphin was particularly suited for where it lived. The Amazon seasonally is swollen by a great rise and fall of its waters—sometimes up to 20 and 30 feet—as a result of its rainforest climate. At those times, the river would flow back deeply into the surrounding jungle, and the Boto—who took advantage of its un-fused backbone to twist and turn through the inundated trunks and vines—made a very good living by catching fish back in there. Bishop, who learned about this odd animal when living in Brazil, also came to understand the mythology that surrounded it. Because of its pink skin and its human-like ability to move its head, the Boto was considered encanto—enchanted. Wonderful tales were told then, indeed, were still being told when I arrived on the river and its upstream tributaries, the Rio Samaria and the Ucayali, and all the rest. The poet wrote of this mystical animal, one that natives believed had great powers. Like with most of her other work, she used exacting descriptions and great subtlety to report on the physical world around her, packing a lot of information into a few lyrics. And while Capt. Cousteau first introduced me to the Boto, the poet entranced me—just as the Boto could do to the natives in the villages along the Amazon. Bishop wrote of certain men transforming into the Boto—and then, wrote of the dolphin reshaping its own self to become a handsome man. In the stories that are still told, the transformed Boto then walks into a village late at night during a fiesta, after lots of mosato has been consumed and all is right with the world. In those times, the handsome man-dolphin is dressed in a white suit with a white hat. The only way you could tell he was a dolphin at all would be if he removed his hat—because, under it, would be a blowhole. Sometime during the masato-soaked fiesta, the handsome man in the white suit would then select the prettiest girl in the village and take her away to the jungle where they would become intimate. Later, she would return to the party and he would return to the river. for the Dolphin spoke to me. but I glimpsed him – a man like myself. I even tore off my shirt. and went through the window naked. My wife slept and snored. This man-to-dolphin-to-man myth is intriguing all by itself. But it was so much more than that. The enchanting Boto also knew the secret to a life that never ended. And this unending life was sustainability—in this case, expressed in an abiding need to protect the river because it provided anything a human could possibility desire. can be obtained from the river. one just has to know how to find it. And so the poem captured the sacred wisdom of the cultural myth. For a long time, the Boto’s world was protected because of its sacred quality. But if the safeguards were grounded in mysticism, they also sustained the very real physical world that gave life to the people who lived in it. It’s no accident that I’ve been thinking a lot lately about our own “Rio San Juan” right here in east Central Florida. A few days ago, I was on a panel in a “summit” devoted to it up in Jacksonville. It was a venue in which the river was diced and sliced, turned into graphs and charts, much talk about numeric nitrate standards, and TMDL’s, and very little about the river as a vital energy source in our broader ecology, and in our imaginations. 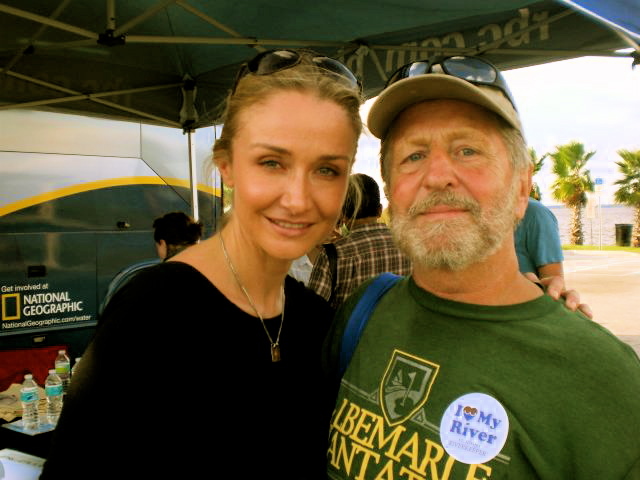 A day or so later, I spent a bit of time here with Jacques’ granddaughter, Alexandra Cousteau, on the St. Johns in Sanford. Alexandra, who is on an extended “Blue Legacy” expedition to bring attention to our fresh and salt water systems, helped with a river clean-up, and provided inspiration, simply be being here. One of the most damaging human diseases today is apathy, a malaisse that’s revealed in a loss of hope. It’s a condition in which there are few remedies, because the heart has been disconnected from all the rest of life, and we are left with a reality in which an engineering spreadsheet carries far more weight than a poem, a song, a book. It’s not enough to simply *care”. If we don’t act on our caring, then we will ultimately vanish as functioning humans—and nothing will be left but the fleeting shadow of a human spirit, and a green puddle of water where the river used to be. Thank you, Ms. Bishop and Ms. Cousteau, for reminding us it can be otherwise. I wonder if malaise is a human condition brought on despair. Despair that our elected officials won’t do what we thought they would do. But even more that when we figure out that they won’t do anything, we still sit around waiting for someone–anyone–other than ourselves to do something. Thanks for the thoughtful comment. I’m figuring that it’s almost a given at this point that a good chunk of folks we elect in Florida aren’t going to follow any ethic-based land management strategy. I think any of us who write or who have access to the media ought to do what we can; have always felt that way. Am not comfortable testifying to commissions and assorted boards, but it’s what we have to do to express how citizens feel about protecting/sustaining what is left. Knowing that others really care can also be an enormous salve. Strong observations, Bill. 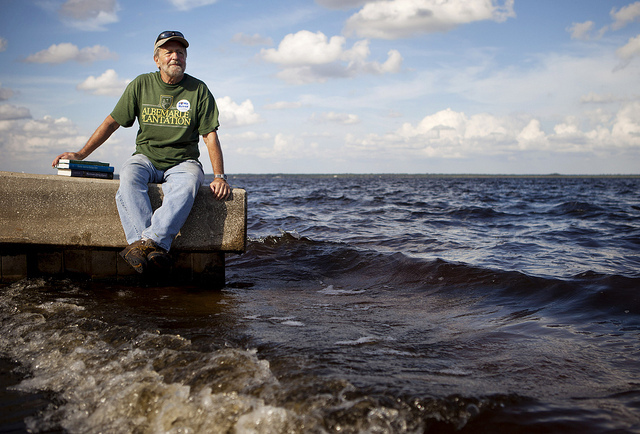 On apathy and malaise — Been discussing the disconnect between humans and the environment with Joe Clark, a learning prof from FSU. I’m wondering if our malaise isn’t a product of apathy, both of which may stem from our disconnection from the land, the water — and if apathy does not create more of itself. Maybe it started with the industrial revolution and ramped up with every new invention or technology, each of which succeeded in delivering us one step farther from our connection to our source. Out of sight, out of mind — yes, but also, out of mind, out of heart. Maybe deep down we mourn our disconnect with the land/water, and which causes a general malaise, which results in our apathy, which causes more malaise and so. This would be only a part of the problem, of course. Hi David- I’m in full agreement that the more distance we put between ourselves and the real world–vis a vis technology of any sort—the less we have the capacity to “feel” all the manifestations of that world. As a teacher I am confronted with dealing with apathy on a daily basis. I feel the apathy in my students originates from the fact that the vast majority have no connection to the natural world. In the end I hope to fight apathy by instilling an appreciation of the natural world in my students. on. You’ve done a formidable activity and our entire group will likely be thankful to you. lost the match. As well as if perhaps you’re pondering the particular store could very well turn regarding together with deliver the discount coupons back towards the producer back to get their funds back. It doesn. The flex waistband desires a load of consumers. that I acquire actually loved account your blog posts. Anyway I’ll be subscribing for your feeds and even I success you get admission to consistently fast. that may cause damage in the long run. When beginning a self massage therapy regimen, start slowly and work your way up. light strokes at the base of the neck. Last although not least, don’t allow carpet stains ruin your party mood. Therefore when cleaning procedure are widely-used, detergents are not essential, since the hot water is pretty hot (150-200 extent F) which is additional than enough to knock out the dirt and filth from that, however, if you still require to use detergent, ensure that you rinse it in the suitable way. At once, experienced Bristol carpet cleaners stake care in utilizing only eco friendly products. I am actually thankful to the owner of this site who has shared this great paragraph at here. Pretty nice post. I simply stumbled upon your weblog and wanted to say that I have truly enjoyed surfing around your weblog posts. In any case I’ll be subscribing in your rss feed and I am hoping you write once more very soon! Maya Books & Music in downtown Sanford, Fla.
Reef Relief, Key West, Fla.